Los Angeles County Supervisors Mark Ridley-Thomas, Sheila Kuehl (left) and Don Knabe (right) celebrate the commendation with Skid Row Housing Trust’s CAO Monique Davis, CEO Mike Alvidrez, Director of Asset Management Jo-Anne Cohen and COO Tonja Boykin. 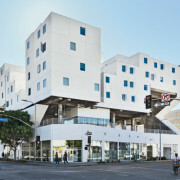 Star Apartments is the product of Skid Row Housing Trust’s pioneering partnership with the Los Angeles County Department of Health Services (DHS). DHS funds case management and supportive services at Star Apartments, and in exchange it identifies and refers individuals to the Star who are homeless and frequent utilizers of its emergency healthcare services. This partnership not only saves lives, but also saves the public millions of dollars that would otherwise be spent on inpatient and emergency care. 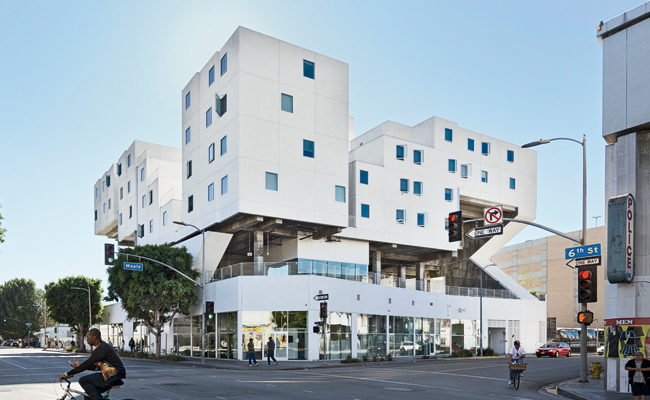 Designed by the world-renowned and award-winning Michael Maltzan Architecture, Star Apartments is an iconic building that aims to inspire residents and the surrounding community. A LEED for Homes Platinum development, the Star features 102 units of permanent supportive housing terraced above a Health & Wellness Center, which includes a community kitchen, art room, running/walking track, and exercise space. Residents can also enjoy a raised community garden, and multiple outdoor patio spaces for group activities. On the ground floor, the Star houses a clinic operated by DHS, which serves both Star residents and the surrounding community. It is also headquarters for DHS’ Housing for Health Division, a ground-breaking team that is committed to funneling resources towards the most critical determinant of health: housing.